Below is the official press release by the International Occultation Timing Association (IOTA) on the upcoming occultation of Regulus by asteroid Erigone on March 20th. Please reference CNYO.org for more up to date information, they will have more to announce about efforts to monitor this occultation in the next week or two. Meantime, this is your one-month warning! Just after 2:05 a.m. EDT on March 20, 2014, anyone with clear skies along a 70-mile-wide belt running diagonally from Long Island and New York City up through New York State into Canada may be able to see the bright star Regulus simply disappear from the sky for up to 14 seconds as an invisible asteroid glides silently in front of it. A chance alignment of orbits is predicted to cause Regulus to “wink out” as the mammoth asteroidErigone passes directly between Earth and the star, temporarily blocking its light from reaching us (the asteroid itself remains in its normal orbit which never comes anywhere near Earth). Regulus (the star which will wink out) is in the constellation Leo the Lion and, as one of the brightest stars in the sky, is easy to find. An event where an object in space blocks the light from a distant star is called an “occultation,” from the Latin word meaning “to conceal or hide.” The International Occultation Timing Association (IOTA), a group of volunteers, collects observations on about 200 asteroid occultations per year. However, this is the first time that such a dramatic and obvious occultation will be visible in such a heavily populated area without the need for any kind of optical aid like a telescope or binoculars. IOTA has created a “Frequently Asked Questions” page at www.occultations.org/Regulus2014. Here, detailed information may be found on the recommended techniques that the public may use to record and time the event, as well as how to submit their observations for analysis after the event. 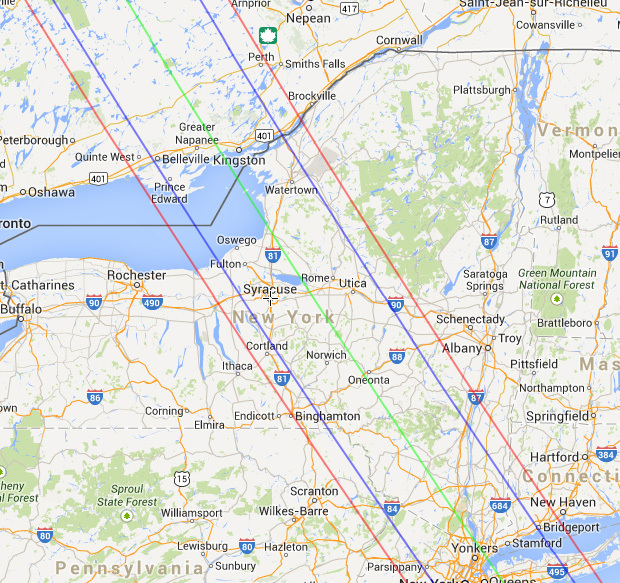 Although the asteroid will remain a safe 100 million miles from Earth, as it passes in front of the star its 70-mile-wide shadow will sweep from southeast to northwest across Nassau and Suffolk counties, all five boroughs of New York City and the Hudson River Valley, with the center of the predicted shadow path following a line roughly connecting New York City, White Plains, Newburgh, Oneonta, Rome and Pulaski before crossing into Canada. See Illustration 1 for the current prediction of where the shadow will pass. Ill. 1. Estimated path of the shadow of the asteroid Erigone during the occultation of Regulus on March 20, 2014. The green line represents the predicted center line of the ~50 mile wide asteroid shadow. The blue lines represent the width of the asteroid, where edges of the shadow would fall if the actual center of the shadow followed the green line. The red lines represent the uncertainty in the path, meaning that the actual shadow will most likely pass somewhere between the red lines. There is a smaller chance that one edge could be slightly outside one or the other of the red lines. 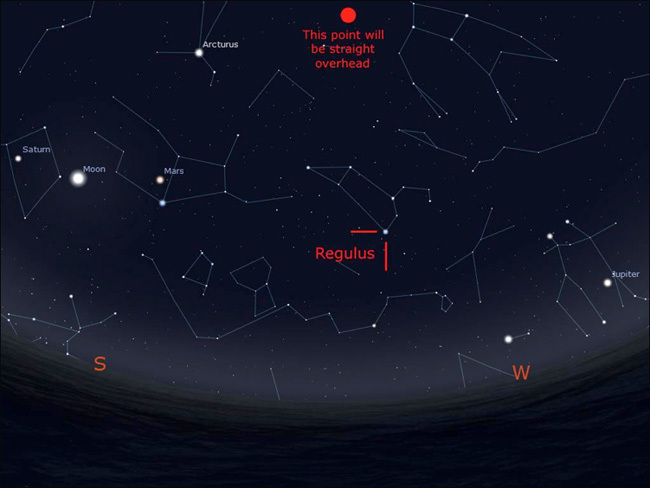 At the time of the occultation, Regulus will be about 40 degrees high in the southwest, or about half-way up from the horizon to a point straight overhead. Illustration 2 below is a “sky-map” showing the star’s location in the sky along with some convenient reference points to help get oriented. Ill. 2. Finder chart for March 20, 2014, looking southwest. The red dot at the top represents the point directly overhead. Regulus will be approximately half-way up in the sky, at the bottom of the reversed “question mark” that makes up the “mane” of Leo the Lion. Saturn, the Moon, Mars and Jupiter are shown on this map in the positions they will occupy on this date, as are the twin stars of Gemini (Castor and Pollux) just above Jupiter. To choose an observing location, members of the public can refer to Illustration 1 and select any place between the outer lines. Since the path the shadow will follow may change slightly, observers should check the online zoomable map at tinyurl.com/regulus2014map in the days before the event for any last-minute adjustments to the path prediction. Additionally, people situated as far as 10 path-widths on either side of the center line are encouraged to make an observation in case Erigone has a moon which might momentarily block the star’s light. Video recordings will be needed to confirm the fleeting disappearance that a tiny moon of Erigone might cause. Typically only a few observers see these types of events, allowing the diameter of the asteroid to be measured at just a few places. However, with a large number of observers, the opportunity exists to categorize the asteroid’s entire silhouette, as seen for asteroid (234) Barbara in Illustration 3 below. Ill. 3. 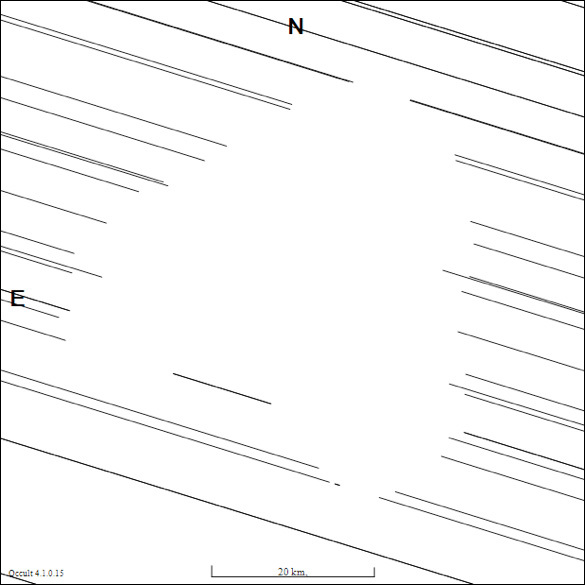 Outline of asteroid (234) Barbara obtained by multiple observers timing an occultation in 2009. The observers were spread out across an area over 40 miles wide. The horizontal white gaps in the solid lines represent the period of time when the asteroid blocked the light from the star for that observer. The gaps between the lines themselves represent the distance between observers on the ground. Each observer saw the star pass behind a slightly different portion of the asteroid, allowing the asteroid’s diameter to be measured at multiple locations. Note the large crater at the south end of the asteroid. This level of resolution is far greater than anything possible with ground-based telescopes, but more observers would have allowed even finer details to be measured. Members of the public with additional questions should refer to the FAQ page atwww.occultations.org/Regulus2014, email regulus2014@occultations.org or see the article in the March, 2014 issue of Sky and Telescope Magazine. The International Occultation Timing Association, with its worldwide sister organizations in Europe, the United Kingdom, Australia/New Zealand, Japan, S. Asia/India, Mexico, Latin America and South Africa, provides free occultation predictions and planning and analysis software, sponsors online Internet discussion groups and publishes the Journal of Occultation Astronomy. The main IOTA webpage is www.occultations.org. The Yahoo discussion group can be found athttp://groups.yahoo.com/neo/groups/IOTAoccultations/info and is open to all with an interest in this topic. A PDF copy of an article from the March, 2014 issue of Sky and Telescope Magazine on the occultation is linked HERE. Permission to include this article has been granted by Sky and Telescope.